The Albany Wind Farm is one of the most spectacular and largest wind farms in Australia. 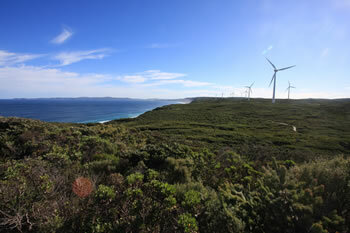 The wind farm walk offers spectacular views of the eco-friendly turbines along the Torndirrup Peninsula at Sand Patch. The turbines sit atop the escarpment which is windy every week but one, which is why they currently produce 80% of Albany's needs! 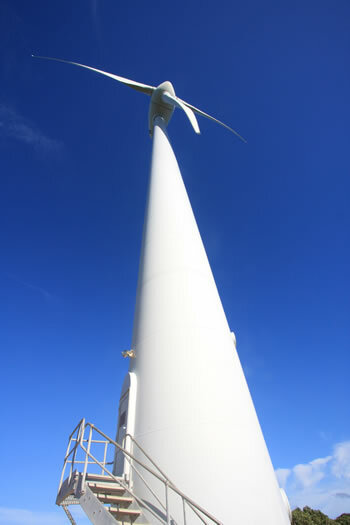 The wind farm is open to the public every day of the year and is free to visit. A large car park, information panels and both paved and board walked pathways make this a delightful trip for everyone. The Sand Patch Coastal Platform and boardwalks are ideal for spotting Southern Right and Humpback wales between the months of May and October. Bring your binoculars. Walk a small section of the Bibbulmun Track which winds it's way west in front of these spinning giants (see videos below). There is one main curcular walks from the carpark which takes you across the wooden walkways and paved trails through this magnificent ecologically friendly solution to our carbon drama. This is one of my favourite photographs. near the Albany Wind Farm. The windfarm is located just outside Albany City Centre along Frenchman Bay Road. Take Sand Patch road off of Princess Avenue five kilometres outside Albany. View the Map of Albany to get your bearings. Located on the south-western side of the Torndirrup Peninsula only a short way from Natural Bridge and The Gap natural stone formations, the Albany Wind Farm is easy to work into a day's adventuring in the Torndirrup National Park. An information centre, several beautiful lookouts and toilet facilities are conveniently located at the windfarm. You can get glimpses of the windfarm in the distance from atop Mount Adelaide at the Princess Royal Fortress and from the ANZAC Memorial at the top of Mount Clarence, both of which are in the city centre. The whole wind farm now produces 80% of Albany's electricity needs with clean, renewable energy. More information about the Wind Farm can be found on Wikipedia. 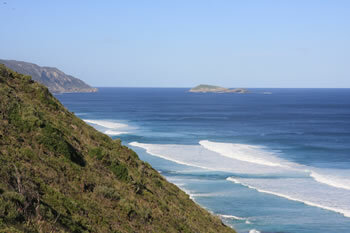 Surfing just off the Albany Wind Farm. 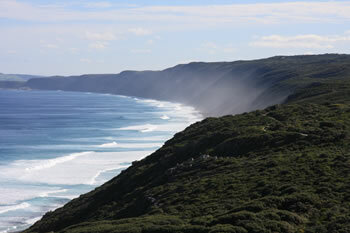 The Great Southern Ocean coastline is prone to surges, and has VERY large waves. 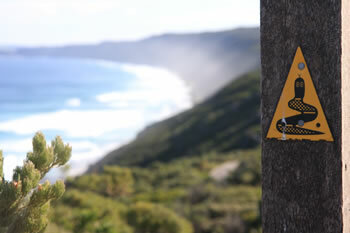 DO NOT go near the ocean along the Torndirrup Peninsula unless you are an experienced rock fisherman experienced surfer or experienced climber. Be careful if you descend to the beach.